The game had ended, and the Vikings were already back in the locker room before Stephen Weatherly learned that he’d gotten a strip sack. The young defensive end knew that he had beaten Eagles right tackle Lane Johnson on an inside pass rush, wrapped his arms around Carson Wentz’s waist and the ball had popped out. All of Lincoln Financial Field saw what happened next: Defensive tackle Linval Joseph snatched the ball out of the air and turned on his wheels for a 64-yard touchdown in the second quarter of Minnesota’s win in Philadelphia. The moment was so much of a thrill that Weatherly didn’t notice whether the play had been scored as an interception or a sack-fumble. When he learned it was the latter, he let out a cheer. The sack wasn’t significant just because it was the second of his career, coming in the third start for the 2016 seventh-round pick. There was a deeper meaning, having to do with the man Weatherly is replacing on the Vikings’ defensive line, and the reason he’s been called upon to do so. In the business of professional sports, the tendency is to measure Griffen’s absence in games missed—three, and counting—for a team with Super Bowl aspirations. But take a step back and consider the human impact; the meaning of a star athlete taking time away to address his mental health, and the potential role it could play in reclassifying mental health as simply part of one’s overall health, breaking down barriers for those in his line of work or others to seek the help they need. Professional athletes, particularly within the last year, are lending strong voices to the growing conversation around mental health awareness. Former Eagles safety Brian Dawkins took the occasion of his Hall of Fame induction to share publicly his own experience working through depression and suicidal thoughts. “There’s something on the other side of this,” Dawkins told the audience during his speech in Canton. Soon afterward, Steve Smith, Sr., the former Panthers and Ravens receiver, wrote a letter on NFL.com entitled, “My personal battle with depression.” And earlier this year, NBA All-Star Kevin Love revealed details about his struggles with anxiety and panic attacks in both a personal essay for the Players Tribune and subsequent media interviews. For now, Vikings staffers and players have been careful not to share details about what Griffen is working through. Little is known publicly beyond what was included in a Minnetrista (Minn.) police report after the team’s director of security, Kim Klawiter, called local police to check on Tiffany Griffen and the couple’s three children. Everson Griffen had been acting erratically; on the Thursday before the Vikings’ Week 3 game against the Bills, the team suggested Griffen, who was already on track to sit out with a knee injury, take the time to also address his mental health. On Sept. 22, the Saturday before the game, local police went to Griffen’s home at Klawiter’s request. The Minnetrista police were also in contact with Leslie Pico, the Vikings’ director of player development. 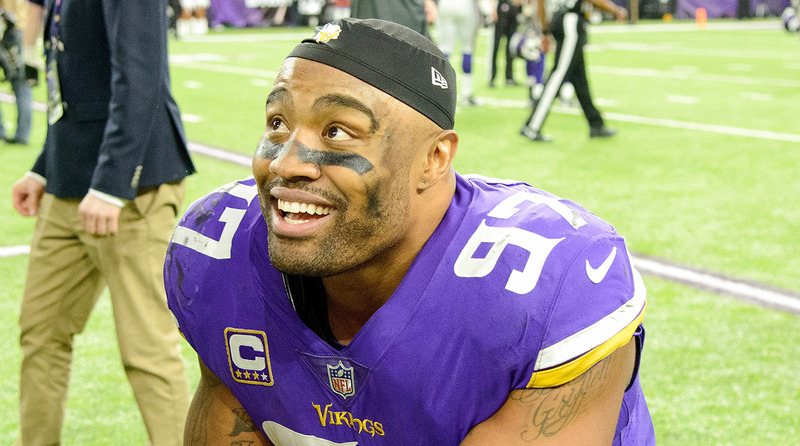 That day, Griffen was also involved in an incident in downtown Minneapolis, reportedly threatening the staff at the hotel where he had been staying, and later tried to enter the home of teammate and neighbor Trae Waynes. When officers spoke with Griffen outside his home in Minnetrista, he agreed to go to the hospital, where a reporting officer placed a health and welfare hold on him. Public figures being open about seeking treatment and working through mental health challenges can have a positive influence on others. “To have players and role models say it’s O.K. to get help can actually save lives,” says John Draper, director of the National Suicide Prevention Lifeline, which runs the NFL Life Line. Joseph is also referencing a specific benefit among Griffen’s Vikings and NFL peers. The NFL and NFL Players Association have worked to establish mental health resources for current and active players, but players must also feel comfortable and willing to seek them out. For most of the NFL, there’s still a stigma in doing so. Studies show that men on the whole are less likely to seek out mental health help than women, and there are specific stressors that come with professional sports culture, including job security and not wanting to appear in need of “help.” Mental health treatment is often not viewed in the same way as treating a knee or shoulder injury. Case in point: While every NFL team has a mental health professional available in some capacity for its players—whether a full-time, in-house staff member or a consulting clinician who is at the team facility two to three times per week—just three NFL teams list that person among their “medical staff” on the team website. In 2012, the NFL launched its Total Wellness platform, with a goal of destigmatizing players’ seeking out of mental health resources, says the NFL’s senior VP of player engagement, Arthur McAfee. NFL players and their families have access to up to eight counseling sessions per year through their Cigna benefits. After Junior Seau died by suicide in May 2012, the NFL also created a free and confidential, 24/7 mental wellness and suicide-prevention hotline and online chat resource. Ciara Dockery, a clinical psychologist and daughter of former NFL player John Dockery, runs this NFL Life Line and trains counselors on the specific issues current and former players and their families often face. • A clinician who works with the team on an ongoing basis and maintains contact with the league office, which offers support services such as training and best practices. • A second clinician who is regularly on-site and may travel with the team to road games when needed. This professional specializes in addiction and behavioral counseling and players and their families have confidential access to him weekly. • A certified mental performance consultant on site every week. • The team has relationships with local psychologists and psychiatrists who have been utilized in the past and continue to be available when needed. • The Vikings’ player development department offers off-the-field assistance to players and their families and leads the rookie success program, which educates incoming players on the available resources. • The organization provides all staff and their families free access to a confidential employee assistance plan that offers phone-based counseling and limited face-to-face counseling. A few Vikings players were asked about these resources, and they said they were not aware of everything that is available. But Weatherly mentioned Pico, the player development director, as someone players could go to for any off-the-field questions. The way the team handled Griffen’s current situation, he added, was reassuring. As Weatherly spoke in the visitors’ locker room at Lincoln Financial Field, he had to take a seat on a stool, because his legs were cramping up. He’d played 92% of the defensive snaps, sitting out just five plays. Danielle Hunter, lining up at the opposite defensive end spot, missed just four plays. That’s a heavy load at a position where players often rotate to stay fresh, but Weatherly is playing for Griffen—literally and figuratively. Their lockers are next to each other at the Vikings’ headquarters in Eagan, Minn., and the advice that Griffen used to give him on a daily basis runs through Weatherly’s head while he’s lining up in Griffen’s spot. Joseph, a team captain, is also doing his part to fill Griffen’s void. No one is certain when Griffen will be back, and that’s a good thing. Perhaps in the future, there won’t be a second thought about writing (mental health) next to a player’s name on the injury report or the gameday inactives, just as you would (hamstring) or (knee). But right now, in an industry short on patience and long on pressure, giving a star player as much time and space as he needs could have a greater impact than anything Griffen could do on the field.